Counter Reformation research papers can be ordered on the Church in Rome's reply to the Protestant Reformation. Research papers on the Counter Reformation discuss this important event in Christian history. Religion papers examine the Counter Reformation for its historical value and the influence it currently has on the Church today. The Counter Reformation was initiated by the Council of Trent, which was convened in 1545 largely to definitively define the doctrines of the Church of Rome in response to the challenges posed by the Protestant reformation. It is highly unlikely that the agenda of an ecumenical council at the time would have focused on this agenda or attempt to alter existing corrupt practices within the Church had it not been for the Protestant Reformation. The documents produced by the Council contain a continuous stream of references to the Protestant doctrines and allegations against the Church and the remedies proposed for revitalization of the Roman variety of Christianity. The Council produced a wide variety of documents that focus on both the delineation of doctrine and the relationship of the Church of Rome with Protestants. One of the more important documents from the perspective of the Counter Reformation was the Decree on Reformation of the Thirteenth Session. This suggests that the relationship of Roman Bishops with Protestants within their diocese should not necessarily pursue the traditional avenue of persecution that had once characterized the Roman Christian response to reformers. In addition, it allowed for an appeal process from a bishop’s decision, which was a revolutionary concept for cannon law of the era. Chapter IV of the document included a change in legal procedure important for the effectiveness of the Counter-Reformation. Prior to this time, clerics were tried in ecclesiastical courts, where they often received more lenient treatment than in secular courts. The heart of the Counter Reformation lay in the “Tridentine decrees” issued by the Council, decrees which tried to strike at the roots of anticlericalism by prohibiting long-standing clerical abuses. The Inquisition before, during, and after the Council was progressively strengthened by giving it more authority and more power. The Counter Reformation attempted to address some of the problems which had been plaguing the Catholic Church for centuries, but it also contained efforts to make the faith more rigid and controlling than it had previously been (Stearns 298). 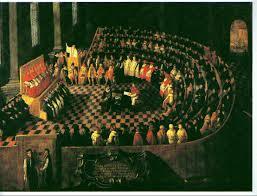 English Reformation research papers trace the history of the reforming of the Catholic Church during the Reformation. Order a research paper on the English Reformation from Paper Masters. Paper Masters writes custom research papers on Counter Reformation and can be ordered on the Church in Rome's reply to the Protestant Reformation.